“You are the sewing lady aren’t you?” said the UPS courier when he called this week. That was a surprise. 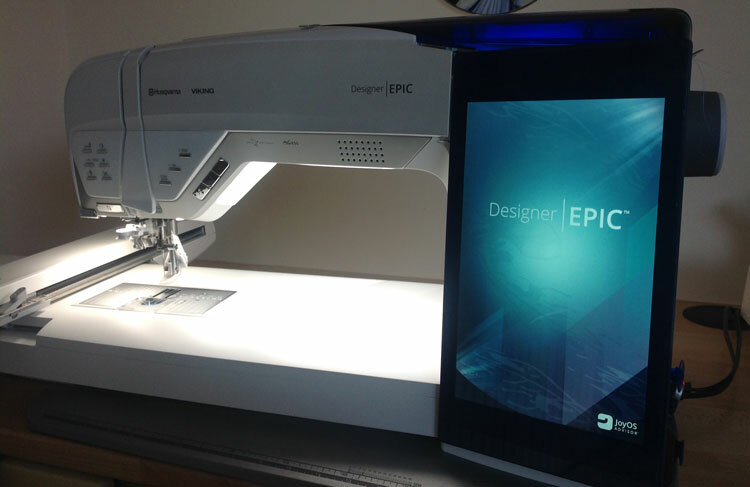 The Husqvarna Viking’s Designer Epic was launched last year but I wanted to wait and see how the embroidery world accepted it, watching the internet for comments and also letting it prove itself. When I was last at my wonderful dealers, Coles Sewing Centre, in Nottingham UK, I had seen the machine and was smitten as it had so many wonderful features that would benefit Graceful Embroidery. The best feature was the 10.24″ wide hoop and the responsive screen. My first concern was how much bigger the machine is to the Designer Royale and their other machines. It is an Epic machine in more than size. The controls and layout are quite different. 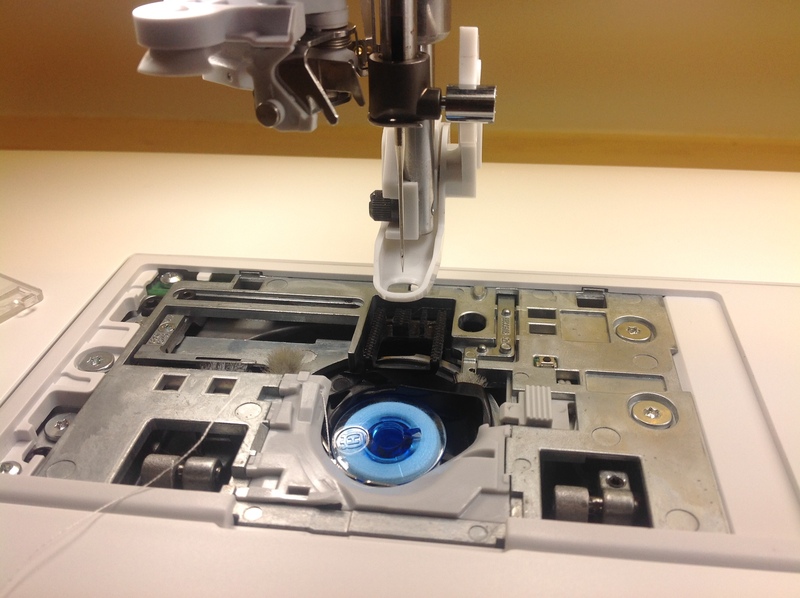 After looking at the machine and being a little confused I realised that with this machine you have to think tablet, so I determined to imagine that I had fixed my iPad to my machine next time I turned it on. Now I can imagine getting used to the machine would take longer if you are not used to tablets like iPads. 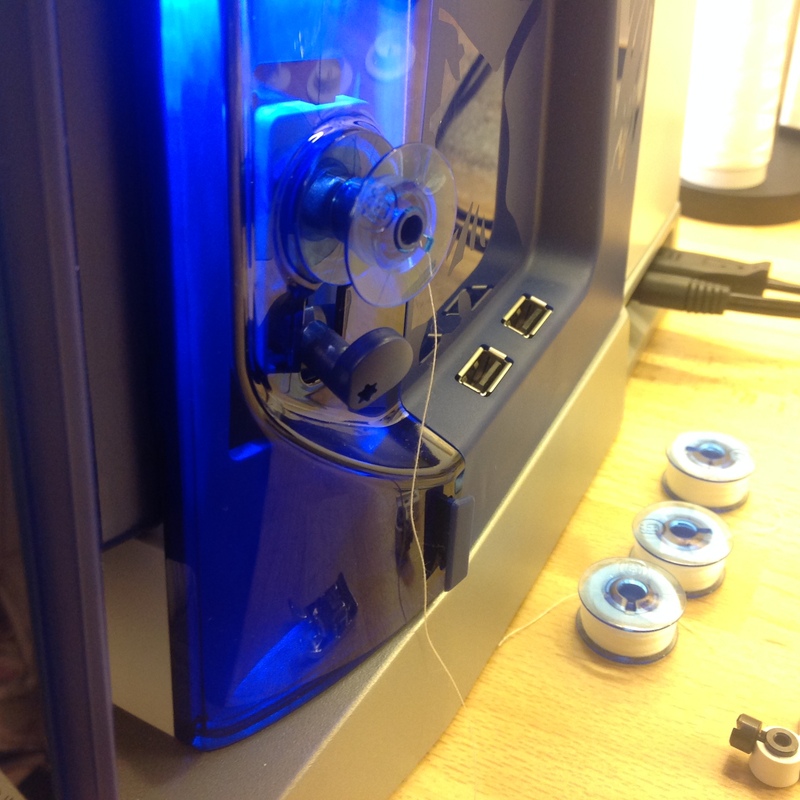 Bobbin winding was easy and I noticed that the bobbin area cover has a little button to release it. Here is the inside. I was not so successful with the automatic threading but I managed to get my Sensor Q foot ready for my first embroidery. As I turned it off I was glad I still have my faithful Designer Royale which I could turn on quickly and use if my confusion lasted. It felt like it would take me a couple of days to fathom all the features of the Epic. Not having a stylus felt strange too but I use a Wacom bamboo stylus solo with a carbon fibre nib for my iPad and that worked perfectly on the Epic. In particular I loved the scrolling in and out of the loaded design, once I managed to get it loaded, as there is no delay. I knew after that first encounter that I was going to love my new machine dearly once I understood a little more about how to use it. Now back to my UPS man who delivered my machine, as Coles Sewing Centre is based 150 miles away, he was very friendly and knew that I was a sewing lady, but he could not help me with my machine, so my suggestion is have a class at your dealer before taking this beast home if at all possible, especially if you struggle with new technology. More later. 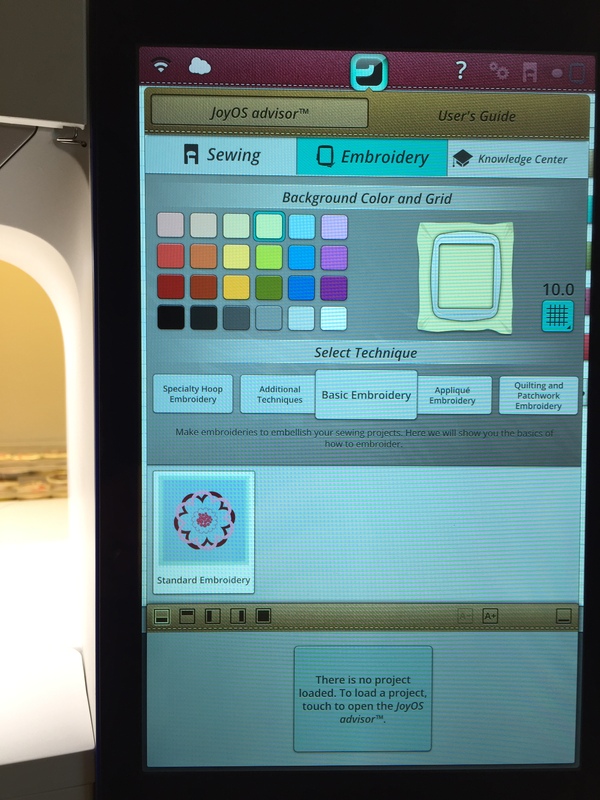 This entry was posted in Announcements and tagged embroidery machines, Husqvarna Designer Epic, machine embroidery, my Sewnet wireless connection. Bookmark the permalink. Congratulations on you new machine! Once you have mastered the learning curve, I am sure you will have many hours of blissful embroidering. Just going to stitch out the large Celtic Angel on the lovely 360 mm x 260 mm hoop. Enjoy Hazel, its always nice to have a new toy, it keeps our minds working. Congratulations Hazel! You’ll just love it! Congratulations! I wish you much joy and delight in using your new Epic. These new ‘super sewers’ are virtually a computer with a needle attached. I, too, kept my 15 year old Quantum XL-6000 with a 240mm x140mm large embroidery hoop; I consider it one of the family. Enjoy learning what it does Hazel. I’m sure you’ll soon master it. I am so very happy for you. May you enjoy countless hours playing with your new friend. I’ve had my Brother Dream Machine for a year now and am still learning her secrets. Its so much fun to get to know new friends! Congratulations Hazel on your new machine! It is a beauty for sure and will bring you countless hours of enjoyment. Looking forward to seeing what you stitch.